There are so many secrets surrounding the lives and deaths of President John F. Kennedy and actress Marilyn Monroe. This novel reveals astonishing answers to these secrets! Why would Lt. John F. Kennedy stop his Torpedo Boat (PT-109) in the midst of the hazardous Japanese shipping lanes known as the Tokyo Express, where it would be sunk by a collision with a Japanese destroyer? And why, despite the fact that General MacArthur wanted him court-martialed, was he instead later awarded a Medal for this action? What was the relationship between JFK and Marilyn Monroe? And why did she commit suicide? Or did she really? Who really killed JFK in <?xml:namespace prefix = st1 ns = "urn:schemas-microsoft-com:office:smarttags" />Dealey Plaza in Dallas on November 22, 1963? And why did it happen? What about the cover-ups? Who ordered the killing of Lee Harvey Oswald on television before the entire world? And why in such a dramatic fashion? Why would the Government cover up the true assassins? And what ultimately happened to them? 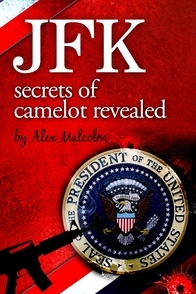 The answers are provided in the novel JFK–Secrets of Camelot Revealed. The novel is based on the Memoirs of Peter J. Sharkey, a Navy mate of JFK, who first met him soon after they both entered the Navy during World War II. Sharkey was on a secret mission on the PT-109 when it went down, and later became a lifelong friend and confidant of JFK. He was both a privileged insider and sometimes an active participant in the events he describes. Click here to order the novel. Directions are available for Kindle (Amazon), Nook (Barnes and Noble), iTunes (Apple), and Kobo. Click on the image to receive a free copy of the novelette The Sinking of PT-109, which is excerpted from the novel JFK-Secrets of Camelot Revealed. Learn why Lt. John F. Kennedy stopped his Torpedo Boat (PT-109) in the midst of the hazardous Japanese shipping lanes known as the Tokyo Express, where it would be sunk by a collision with a Japanese destroyer. And why, despite the fact that General MacArthur wanted him court-martialed, he was instead awarded a Medal for this action! Read The Sinking of PT-109 to learn about this early mystery regarding John F. Kennedy when he was in the Navy during World War II, long before he became the President.